What a great night! 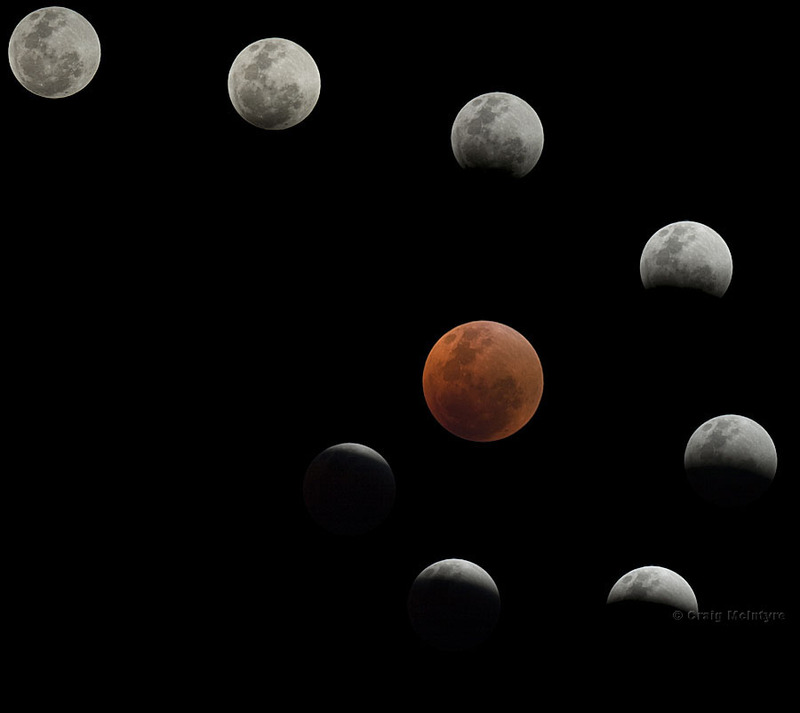 Having not seen a total lunar eclipse in my hemisphere for at about 7 years, I was pretty keen to capture some photos of this one. And what better place to do it than with Sydney Harbour as the stage. Being the only person at McMahons Point with a telescope and multiple cameras set up I got my fair share of strange looks from passer-bys and ferry captains. But when the eclipse started (at quite a socially acceptable time), people came out of everywhere to sit on the harbours edge and enjoy the show with many people hanging around me to ask questions and talk about the eclipse underway. It was great to see so many people look up and take an interest in the night sky. 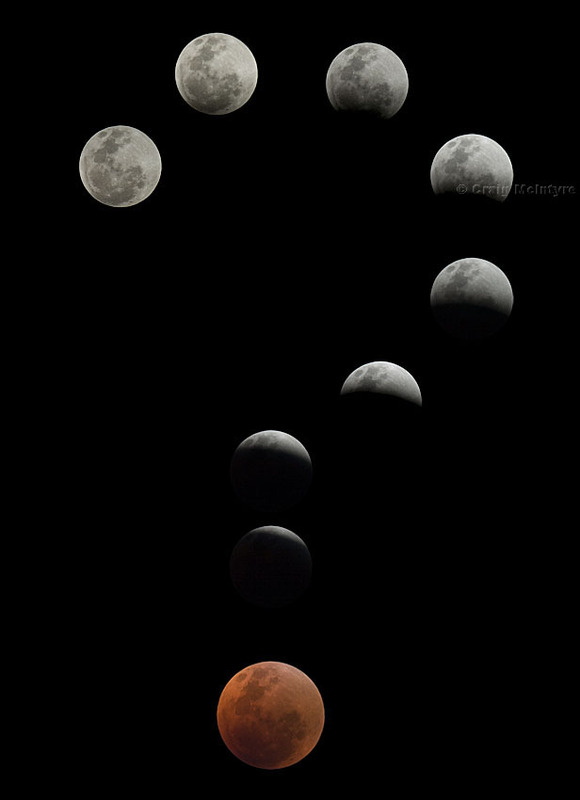 Above: The ingress phases of the total lunar eclipse. Due to the extreme difference between the highlights and shadows of the Moons partial phases it was impossible to capture them both in a single camera image. 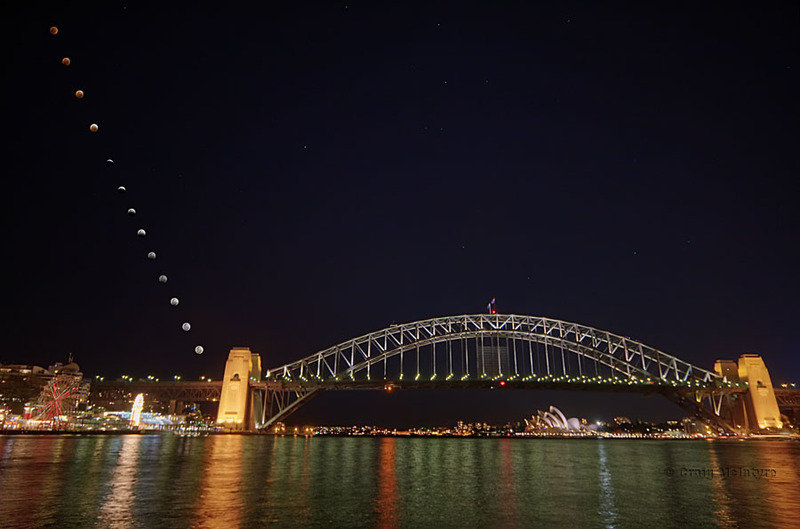 Below: Moonrise and eclipse over the best harbour in the world! Whilst some clouds on the horizon obscured the first moon sightings, they soon disappeared after dusk and you could not have had a clearer night for the event. With the moon in totality there were clearly (no pun intended) more stars visible in the night sky, despite being in a city of 4 million. Above: What the...?? Imagine the confusion that would have occurred in old times when civilisations didn't understand what was happening to the moon. Christopher Columbus can attest his survival to a sharp knowledge of a particular lunar eclipse when faced with starvation on his journey to the new world. Read about it here. All photos and content (except where marked) Copyright Craig McIntyre 2007.